02. 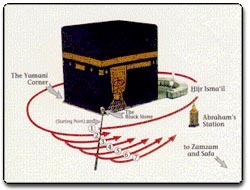 Tawaaf: Around the Holy Kaaba seven cycles. 03. Salaat Al-Tawaaf/Prayer of Tawaaf: Two Rakats by or behind Maqam-e-Ibraheem (pbuh). 04. Sayee: Between the Safa and Marwah seven times. 05. Taqseer or Halaq: Trimming some of one's hair or finger nails. 01. Ihraam: It is the first compulsory act of Umrah. There are three compulsory acts in Ihraam. When making Niyyat for Umrah or Hajj the purpose and aim must necessarily be solely to achieve the consent of Allah and seeking nearness to Him (Qurbatan ilallaah). The intention must exist when commencing the acts, i.e. when wearing Ihraam. 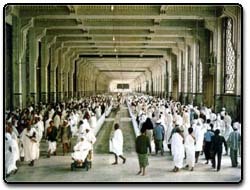 The Niyyat of Ihraam must be specified to be that for Umrah or Hajj, that of Tamattu, individual or combined, that it is one's obligation or on behalf of someone else and that it is Hajjatul Islam (to be performed only once in a lifetime by a person meeting its requirements) or to fulfill a vow or in lieu of some compulsory Hajj that was previously nullified or a mustahab Hajj. Ihraam without intention will be null and void. "I am wearing Ihraam for Umra-e-Tamattu for Hajjatul Islam Wajib, Ada, for myself, Qurbatan ilallaah." "I am wearing Ihraam for Umra-e-Tamattu for Hajjatul Islam Wajib, Ada, for and on behalf of ... (Name of the person) Qurbatan ilallaah." (2) Talbiyah: Immediately after wearing Ihraam, recite Talbiyah in audible voice. One must pronounce and recite the Talbiyah himself. A person who is dumb should point with his finger and move his tongue. Without Talbiyah Ihraam is invalid just as without Takbiratual Ihraam a Namaz/prayer is invalid. As soon as one has pronounced Talbiyah the 28 acts stated earlier become HARAAM. Of pure silk (even for women). Part of the animal, whose flesh is not eaten. However, no formal ablution is necessary for Ihraam. To wear Ihraam for Umra-e-Tamattu. To enter the Haram (boundary) of Makkah. To enter the city of Makkah. To make Tawaaf of Khana-e-Kaaba. 02. Tawaaf: It is the second compulsory act of Umrah. If one omits this act whether knowingly or because of ignorance of the rule, the Umrah becomes null and void, and as a result one's Ihraam also becomes void. A Tawaaf is a complete act of going round the Kaaba seven successive times. (1) Intention (Niyyat) can be expressed in these words: "I am performing the Tawaaf of this Khanae-e-Kaaba seven successive times for Umra-e-Tamatt for Hajjatul Islam Wajib Qurbatan ilallaah ". (2) Formal purification i.e. wudhu is wajib, or Ghusl, if necessary. Without purification the Tawaaf is not valid, whether it is omitted knowingly or out of ignorance or forgetfulness. If the Taharat breaks before completion of the first half of Tawaaf (i.e. 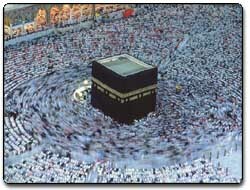 31/2 rounds) that Tawaaf becomes void and, therefore, it must be performed again after renewing the formal Taharat. If one's Taharat is unintentionally broken after completing the fourth round then he should discontinue his Tawaaf, renew formal Taharat and complete the rest of the Tawaaf from the point he had interrupted it. If one's Taharat breaks unintentionally after the first half of the Tawaaf (i.e. 31/2 rounds) but before completing the fourth round, it is ihtiyat to act as in (2) and then perform the whole Tawaaf again with the Niyyat: 'I perform what I owe as a complementary to the first or as an independent Tawaaf'. Although Tawaaf can be started from a point opposite Hajar-e-Aswad, as a precautionary measure, as illustrated in the sketch, it should be started and Niyyat of Tawaaf performed, at least one or two paces before this point. While performing Tawaaf it is necessary to ensure that the left shoulder always remains pointed towards Khana-e-Kaaba, and one's face, chest and back should not face Khana-e-Kaaba. The two corners of "T" shown in the sketch indicate the position of the two shoulders. 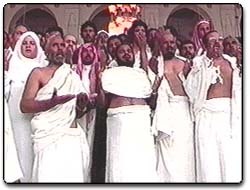 The "T" shows how to turn shoulders while performing Tawaaf. If one happens to contravene any of the above conditions inadvertently, he should go back some paces from the spot where he contravened (go backwards without turning) and resume Tawaaf from there. The other thing, which has to be ensured in performing Tawaaf, is that one should not kiss or touch the walls of Khana-e-Kaaba nor the walls of Hateem (a semi-circle structure about 4 feet in height, also known as Hajr-e-Ismaeel/Hateem). 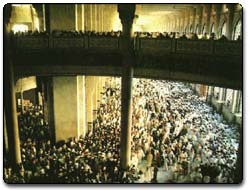 In order to safeguard that one does not go out of the Tawaaf limit (because the Haram has been recently expanded and, it is possible that Tawaaf line may have been extended without taking into consideration the original Tawaaf markings) one should remain as close to the walls of Khana-e-Kaaba and particularly Hateem as possible without touching them because the walls of Khana-e-Kaaba are built a little inside the original foundation of Khana-e-Kaaba. A woman who is in menses when she wears or is already wearing Ihraam of Umrah has to wait until her period ends to perform Ghusl and fulfill her obligations if there is enough time for her to complete the Umrah. If the menses start when she is wearing Ihraam then the Niyyat should be changed from Umra-e-Tamattu to Hajj-e-Ifrad (Individual). After fulfilling the required rituals of Hajj-e-Ifrad she has to perform, if there is an opportunity, Umra-e-Mufrida with a Niyyat of Wajib. If her monthly period commences when she is already in the state of Ihraam then she has the choice either to perform Hajj-e-Ifrad as in (1) or complete the acts of the Umra-e-Tamattu without Tawaaf and its Namaz. She would wear Ihraam for Hajj-e-Tamattu and when she comes back from Mina after completing other rituals, perform her Tawaaf of Umrah before that of Hajj. In case the bleeding does not stop even after returning from Mina, she has to appoint some one as her agent to complete a Tawaaf on her behalf and complete the other rituals herself. One must be in Taharat, i.e. Wudhu or Ghusl. The clothes of Ihraam must be free from Najasat. Even a dot of blood, which is normally allowed in prayers, is not allowed in Tawaaf. One must have been circumcised. The body must be adequately clothed so as to hide the genital organs, as required in prayers. The Ihraam clothes must be Mubah (not Ghasbi), i.e. must be free from all financial obligations and debts inclusive of Khums and Zakaat. If the doubt occurs after the Tawaaf is over about the number of the circles around the Khana-e-Kaaba, no attention is to be paid to it and the Tawaaf is correct. 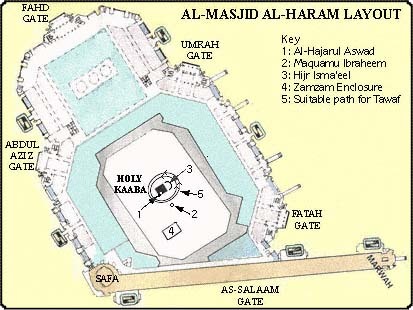 If the doubt is about the number of circles around the Khana-e-Kaaba, i.e. whether a certain circle is the sixth or the last one, the fifth or the sixth one and so on, the whole Tawaaf will be considered invalid and should be repeated. In case one is certain of walking seven times, but doubts whether some additional ones are made or not, he need not pay any attention to his doubt except if the doubt is before completing the last circle around the Khana-e-Kaaba, in which case, apparently, the whole Tawaaf will be in-valid. He should perform it again. The Tawaaf should be performed outside the walls of Khana-e-Kaaba and the C shaped wall of Hajr-e-Ismaeel. One should not pass over the protected dwarf walls of the Khana-e-Kaaba or touch the wall of Hajr-e-Ismaeel or stretch hands over it. If this is done, that part Tawaaf is invalid and one has to return to the place where the mistake was made and after completion the whole Tawaaf needs to be repeated. Muwalaat: All the seven rounds should be completed one after the other without stopping. To read Zikr, Qur'an or Duas during Tawaaf. For details refer to Manasik-e-Hajj. To salute Hajar-e-Aswad when reaching in line with it on every round with the hands raised towards it and saying, "BISMILLAHI ALLAHU AKBAR". To walk with complete ease and peace of mind and with full reverence: neither too fast nor too slow. To avoid all the forbidden things in Namaz. To do Tawaaf during Zohr. If possible close eyes during Tawaaf. To be as near the Khana-e-Kaaba as possible without violating the rules mentioned earlier. 03. Salaat Al-Tawaaf/Prayer of Tawaaf: It is the third compulsory act of Umrah. It consists of two Rak'ats like that of morning prayers. It must be prayed immediately after the Tawaaf near Makam-e-Ibrahim. To omit this prayer invalidates one's Hajj because it will also cause the invalidity of Sayee, which depends on the validity of the prayer of Tawaaf. If this prayer is forgotten and is remembered after Sayee it has to be said then without needing to make Sayee again, although it is better to do another Sayee. If one remembers it during the Sayee should leave the Sayee and say the prayer and then complete his Sayee from the point he had left. In case one remembers it when he is out of Makkah he must come back to complete it in the prescribed place. If this is not possible, then he has to do it at the place it is remembered. Intention (Niyyat) can be expressed in these words: "I pray the two Rakaat Salaat Al-Tawaaf for Umra-e-Tamattu Hajjatul Islam Wajib Qurbatan ilallaah." Salaat Al-Tawaaf can be prayed either audibly (Jahri) or in whisper (ikhfati). 03. Sayee: It is the fourth compulsory act of the Umrah. If it is omitted intentionally, it causes the Hajj to become void, regardless of whether one knows this rule or not. Sayee means walking from Safa to Marwah and back seven times. Thus the walk begins at Safa and ends at Marwah. Starting from Safa one should walk to Marwah and this constitutes one walk, from Marwah back to Safa the second and so on up to seven walks finally ending at Marwah. Sayee must be performed after Tawaaf and its prayers. During Sayee it is necessary to face the direction one is going towards else it becomes invalid. But there is no harm in turning a bit on either side. Sayee and its prayer must not be delayed after Tawaaf without a valid reason. Nevertheless in case of severe heat or tiredness it can be postponed till nightfall but not until the next day. 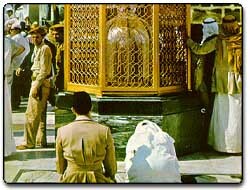 In general the rule of doubts about the number of movements of Sayee is the same as those of the circles of walking around the Kaaba, i.e., a doubt about its number tenders it invalid and has to be performed again. Intention (Niyyat) can be expressed in these words: "I walk from Safa to Marwah, and Marwah to Safa seven times for Umra-e-Tamattu for Hajjatul Islam Wajib Qurbatan ilallaah." It is better to ascend and descend the mountains of Safa and Marwah on each movement. Also it is better to be in Tahaarat but it is not Wajib. One who cannot make Sayee himself or on somebody's shoulder or on a hand carriage, can appoint an agent to do Sayee on his behalf. It is allowed to rest for a short period at Safa or Marwah. At a certain distant between Safa and Marwah, between the two Minarets decked by green light, it is Mustahab for men to trot (like jogging) and for women to walk faster. This action is known as Harwala. To be with Tahaarat i.e. Wudhu or Ghusl. Before performing Sayee to kiss or make salaam to Hajar-e-Aswad. Before performing Sayee to drink the water of Zamzam and pour it on one's body. To proceed to Safa for Sayee through the door facing Hajar-e-Aswad called Babus-Safa. To go with peace of mind and reverence. To climb the steps of Safa and to kiss the corner of the stone of Safa. To thank the Almighty and praise Him and remember His kindness. To read Duas and Zikr during the walk. For Duas refer Manasik-e-Hajj. 05. 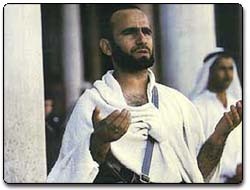 Taqseer or Halaq: It is the fifth compulsory act of Umrah and means cutting some nails of hands or feet or the hairs of head, beard or moustache. Intention (Niyyat) can be expressed in these words: "I perform taqseer to become MUHIL (To make Halaal for myself whatever was forbidden for me during Ihraam) from Ihraam of Umra-e-Tamattu for Hajjatul Islam Wajib Qurbatan ilallaah." The only prescribed way to legally come out of the state of Ihraam of Umra-e-Tamattu is Taqseer. To shave one's head is forbidden at this juncture. In case one shaves the head, the expiation is one sheep, if it is done willfully and knowingly. However, it is mustahab to expiate even if done by error. It is not necessary to do Taqseer immediately after Sayee. One is allowed to do it anywhere he wants. If Taqseer is omitted willfully, one's Umra-e-Tamattu becomes void and, apparently, his Hajj becomes Hajj-e-Ifrad (Individual Hajj). As a result he has to complete another individual Umrah after this and ihtiyatan perform another Hajj the following year. If it is omitted because of forgetfulness and one has worn Ihraam for Hajj, his Umrah will be valid and ihtiyatan one sheep should be given in expiation. Tawaaf-Un-Nisa (The Tawaaf of Women) is not an essential part of Umra-e-Tamattu, but if desired it can be performed in addition to the other rituals of Umrah with the Niyyat of Ihtiyat (Raza-e-Mattlubi).